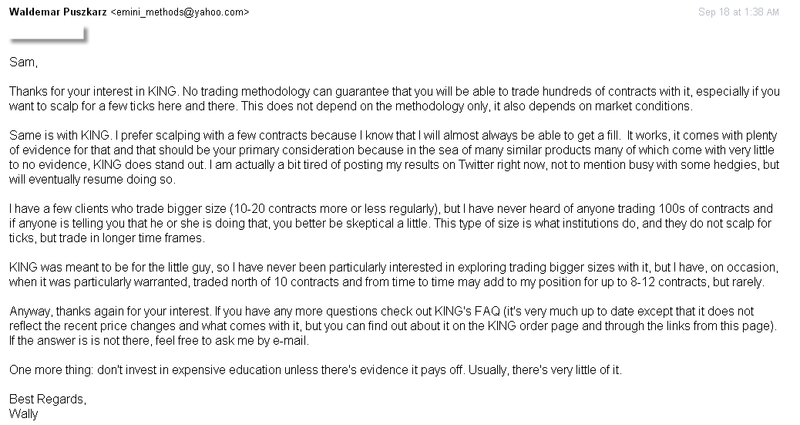 I got this e-mail from a prospective client of one of my e-mini futures products (KING, to be specific) with a rather unusual question that may indicate that the guy, if not stopped, is on his way to blow an account or two, and rather fast. As you can tell from my e-mail response to his question, I tried to stop it, but I am not sure I have succeeded. Only time will tell. You are ultimately on the mercy of Mr. Market. He calls the shots. Smart traders try to cooperate with the guy. Those who don't, sooner or later get annihilated. Let me be more specific. You cannot trade a very large number of contracts as easily as a small number of them because this is bound to result in problems with fills. You may not get your position filled at the price you want and you may not get it released at the price you want to do so, either. This poses a particularly serious problem when the market is moving fast and against you. You may end up losing thousands of dollars in the blink of an eye. Judging by this fellow's question my competitors are doing one hell of a job selling dreams of getting rich by ever increasing the number of contracts. Not just hundreds, anymore. These days apparently it's thousands. No kidding. A retail trader doing thousands of contracts? Well, anyone telling you that should present some evidence to back it up. That I have yet to see. Let me tell you a little story in connection with that, with the claims of "moving" hundreds of e-mini futures contracts, that is. There was once a guy, a trading "teach" who was working for a largely discredited (but still very active) trading training outfit. No, they never go away, no matter how discredited they may get. There is a sucker born every day, and more than one, so that keeps them alive and even kicking. I hope you will not find yourself on the receiving side of these kicks. This trading "teach" was claiming to be trading hundreds of contracts during his online training sessions. Yep, that many. Hundreds. Eventually he was exposed of lying. He was "moving" them on a simulator only. Hey, I can do this too! Not only that, but apparently he also had audited brokerage statements to prove it, which means that he was (or is) a total fraud. Well, I said "apparently," because I am not completely sure about that part of the story having read it on some trading forum and I distrust most of what is posted there. But I know for a fact that he did lie about "moving" hundreds of contracts and got eventually fired from that trading training outfit. Only when he got exposed. Not a moment too soon indeed: they let him lie like a dog all the time and only when he got exposed that suddenly became an issue. Talk about high ethical standards. He started his own training business online, so you may run into him. No, these people never go away. They don't have to. Remember, there is a sucker born every day who will believe anything including that you can get rich "moving" hundreds of contracts. Oops, I really meant thousands. Yes, these days it's thousands apparently. So much about claims like that. Now, that does not mean that you cannot trade thousands of e-mini futures contracts, even in principle. It is possible to do so, but that takes more complex strategies, usually involving hedging, and not some naked trading that most retail traders practice. Also, e-mini futures markets are not among the most liquid ones. The institutions are more likely to trade bigger (full-fledged) futures contracts. Not to mention stocks (even more liquid) and use e-minis for hedging. Diversification is also important for institutions, and it may be easier to diversify using stocks than e-mini futures (or futures, in general), though the latter can be used and are used for that purpose too. It's very unlikely you will ever come across a retail trader who is trading thousands of e-mini contracts at a time. If he ever does so, it's the total (in many trades a day) rather than the size per position. Don't believe everything you read or see on the Internet unless it comes with some evidence. The more of it and the more solid it is, the better. Usually, claims like that are never well supported to take them at the face value. If you are a retail trader, I suggest you stick to a few contracts at first, and forget about trading hundreds. You can do just fine with tens of them if you are more aggressive and skillful enough to do so, but it is as much practice as the methodology itself that is required for that. There is no magic wand and no shortcut is more effective than practice. In other words, it's the mastery that is the key to trading profits rather than a large trading size. The latter increases your risk of loss, even a serious loss, and may impact your performance as any psychologically negative factor would. On the other hand, the trading mastery can reduce this risk and give you confidence to take trades you might not have taken otherwise thus leading to greater profits. Most people never manage to do well with a handful of contracts, let alone hundreds of them, so start small and consider increasing your position size only if you are comfortable with your current smaller one. I tend to be rather conservative when it comes to the position size, and perhaps that's why I have been able to survive more than 12 years now as a day trader, while those "moving" hundreds of contracts had to move (pun intended) to another "teaching" job. Posted on September 22nd, 2015.